Rookie boss Paul Warne is looking for an early finish as he bids to strengthen his Rotherham United squad in the January transfer window. 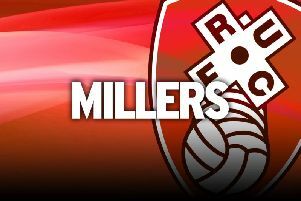 The Millers, gearing up for Saturday’s Championship derby with Barnsley, have made “serious” bids for three players. The deadline for deals to be done is 11pm on Tuesday but, with Rotherham in action that night at Nottingham Forest, Warne wants the wheeling and dealing to be over well before the 7.45pm kick-off at the City Ground. The caretaker manager is hoping there could be at least one new arrival before the clash with the Reds at New York Stadium. Fitness coach Warne was given the hot-seat 10 matches ago following the shock resignation of Kenny Jackett and is receiving behind-the-scenes backing in his first ever transfer window from chairman Tony Stewart and new head of recruitment Jamie Johnson. “Jame is suggesting players to me regularly,” he said. “His role is to obviously help me during a difficult time to get players in. The division’s bottom side, who brought in goalkeeper Richard O’Donnell last week, need reinforcements after the departure of five players this month and with operations ruling out keeper Lee Camp (knee), centre-half Kirk Broadfoot (back) and midfielder Lee Frecklington (ankle). “We’ve let a lot of players leave the club, players who we didn’t forsee playing a big part for us before the end of the season,” Warne said. Eighth-placed Barnsley have been hit by a double blow, with midfielder Conor Hourihane and young right-back James Bree joining second-tier rivals Aston Villa. The Reds have offset the loss of Hourihane, who scored six goals and made 11 assists for them this term, by bringing in Leicester City’s Matty James on loan. Athersley Rec striker Kai Hancock has been training with Rotherham. The 20-year-old, who has netted 26 times for the North Counties East League Premier Division side this year, has previously trained with Barnsley.